Yeoville is like another country. This is what artist Terry Kurgan proposes at a press briefing for her latest public art project dubbed Hotel Yeoville. Certainly for liberal whites like her who perhaps squandered parts of their youth in the bohemian cafes and clubs that once flanked Raleigh Street, Yeoville is unrecognisable. Its character and population has shifted considerably since the late nineties when migrants from around the African continent from such places as the Democratic Republic of Congo (DRC), Ghana, Mozambique and, of course, Zimbabwe, settled in the neighbourhood and reinvented it to suit their needs. Though a few South Africans remain in the suburb, it is estimated that more than 70 percent of the suburb's residents hail from the rest of the continent. The physical infrastructure of the neighbourhood is dilapidated, but the streets are buzzing with activity and trade is brisk with an abundance of small shops, hair salons and internet cafes attracting locals. The stylised signage that advertises some of these establishments has a distinctly West African vibe; the images recall the personality of the art of Chéri Samba, a painter from the DRC, whose work was exhibited at the Johannesburg Art Gallery during the Africa Remix exhibition. So for all intents and purposes Yeoville perhaps does look like "another country" - albeit an African one. Kurgan's statement is not only revealing of the physical changes that have taken place in the neighbourhood, but of the disconnect between South Africans and the migrant communities that have settled in Joburg's inner city suburbs. During the xenophobic attacks which saw thousands of African nationals victimised by South Africans in 2008, this unseen community came into focus. Kurgan suggests that the media's gaze directed attention to this community's most vulnerable and disempowered members, creating a slightly false, if not unrepresentative picture of the foreign African population in this country. Her aim is to counter-balance some of those sensationalist images that ran on the front pages of newspapers depicting migrants as victims of violence by summoning the more everyday details of their lives. "There is political importance in becoming familiar with the every day life of this community," urges Kurgan.One senses that the Hotel Yeoville project is driven to not only get an authentic grasp on this community which lives on the fringes of our society, but to satiate our curiosity; who are they? Why have they come here? Kurgan's interest in this community can be traced back to the early noughties when she was working on another public art project in the inner city, dubbed the Joubert Park Photo project. After identifying that photography was "at the centre of the culture and economy of the park", Kurgan established a permanent studio for the photographers who operated from fixed positions in the park. In the course of this community project Kurgan noticed that many of the portraits the photographers made went unclaimed. This made her aware of the transience and shifting demographics of the African population that dwell and pass through Joburg's inner city. She wanted a project that would offer more insight into this community by mapping their lives, their experiences. When she first envisaged the project, it involved door-to-door interviews, where respondents would be asked to share their life story before having their photograph taken. The photographs and stories would then go on display in a public space. But the residents were reticent about opening their doors and revealing their stories. "They thought we were with Home Affairs. It just didn't work," observed Kurgan. As an acclaimed photographer known for her probing and engaging portraits of young teens on the cusp of adulthood, Kurgan was also only too aware of the politics of representation: the baggage and responsibility that comes with representing minorities. Thus she concluded that the content of the project should be produced by its subjects: Yeoville's inhabitants. Research revealed that locals were eager web users: there are over 30 internet cafés in the suburb's main street. It made sense then to create an interactive website where Yeovillites could exchange information and document their experiences. Thus Hotel Yeoville doesn't exist per se; it is a virtual destination that primarily has a presence in cyberspace. Hotel seemed an appropriate designation as it is mostly geared to map the social life of the suburb's transient population. There is nothing remarkable about websites that bind communities via various forms of social media, but this one is unusual because Kurgan and her many collaborators, which include artists Tegan Bristow, Alex Opper and Guylain Melki, have worked at giving physical expression to some of the virtual spaces that they have created online. 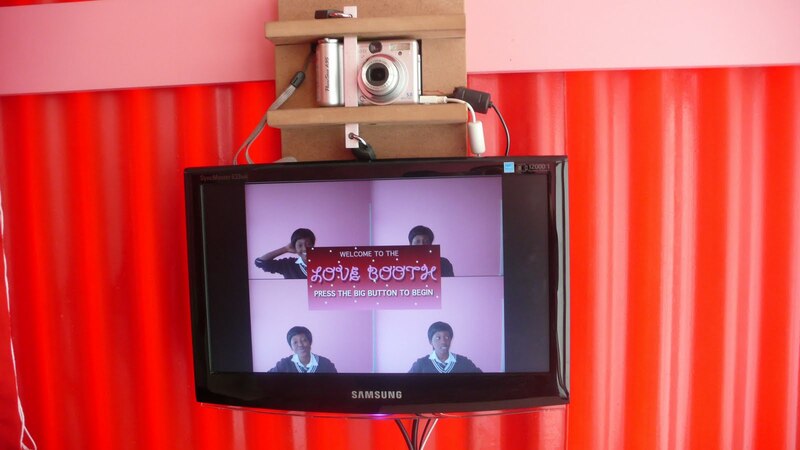 On the second floor of the neighbourhood's new library there are a number of booths that introduce some of the different sections on the website such as the story booth, where visitors can type their stories or the film booth where they can film themselves and make Youtube videos. The Love Booth is concealed behind a bright pink enclosure boasting a stylised image of a couple. The loss of love and family is a common concern in the foreign population of Yeoville, where many have left their loved ones behind to pursue study or work opportunities in Joburg. On paper the project ticks all the right boxes; it sounds novel, progressive, and it's community driven. However, when one visits the website and downloads the videos that some of the participants have made they are very brief and mostly playful - barring one or two in which the creators talk about xenophobia. Certainly Kurgan's idea was to document the everyday, but perhaps some of the material is so banal and insubstantial that one wonders whether it really does offer a significant view into the lives of Yeovillites. Mostly it is teenagers who have created videos and the length of each clip is too short to offer any real insight. One also wonders what function the project is really fulfilling for Yeovillites that aren't being satisfied by the internet cafés in the neighbourhood where they can access communities around the world and the ones they have left behind? The project has only been up and running for a month so it might be too early to gauge its success. But the most niggling question is what will happen to Hotel Yeoville when funding for the project runs out at the end of the year? Kurgan hopes that one of the local community organisations will find a way to sustain it. The photographers' studio which she established in Joubert Park remained operational for only three years. According to her website, the photographers in the park "are currently working on a business plan and fundraising towards a more permanent studio environment both outside and inside the park".